A trapping license is required and a Trapper Education course must be passed. See License Information & Fees and License, Permits & Stamps for license information. All traps set or used must bear a legible tag of durable material with the name and address of the person setting, using and maintaining the traps. Trap tags with a previous Fish and Wildlife-issued trap identification number or the trapper’s Conservation Identification Number (CID#) may be used in lieu of name and address to mark each trap. No traps or trap stakes are to be set prior to 6:00 a.m. on the first day of any open trapping season indicated in this section. No trapper may set cable restraint traps prior to 6 a.m. on Jan. 1 on any wildlife management area where pheasants or quail are released. Areas include Assunpink, Berkshire Valley, Bevans (Millville), Black River, Clinton, Colliers Mills, Flatbrook-Roy, Glassboro, Greenwood Forest (incl. Howardsville), Heislerville, MacNamara (Tuckahoe), Mad Horse, Manahawkin, Manasquan River, Medford, Nantuxent, Peaslee, Pequest, Port Republic, Stafford Forge, Walpack, Winslow and Whittingham WMAs. ONLY cage and foot-encapsulating traps may be set on the above WMA between Nov. 15 and Dec. 31. Trapping is prohibited at all times on the Delaware Water Gap National Recreation Area. All traps must be checked and tended at least once every 24 hours, preferably in the morning except traps set for semi-aquatic species in tidal waters only must be checked once per calendar day. No trap shall be permitted to remain set on any property at the close of the trapping season. No person shall steal or attempt to take traps of another, or remove a trapped animal without permission of the trap owner. Any person (including a farmer) who traps a coyote must report their harvest to the nearest Division Regional Law Enforcement Office [North—(908) 735-8240; Central—(609) 259-2120; South— (856) 629-0555] within 24 hours. Callers must identify themselves by name, CID# and daytime phone number. Licensed trappers may use an air gun (not smaller than .177 caliber nor larger than .22 caliber) or a center- or rim-fire rifle (not larger than .22 caliber) using only .22 caliber short ammunition to dispatch legally trapped animal other than muskrat. Youth trappers (ages 12–13) using any firearm to dispatch must be accompanied by—and under the direct supervision of—a properly licensed adult (at least 21 years of age). A Rifle Permit is required when using center- or rim-fire rifles, but is not required when using an air gun. Firearms may not be loaded with more than three rounds. See General Hunting Regulations for safety zone information that also applied to trappers. While trapping is legal within a safety zone, one cannot possess a loaded firearm within a safety zone unless having written permission, in possession, from the property owner or lessee. Beaver may be taken only by properly licensed trappers in possession of a special beaver trapping permit valid for an entire management zone, or a special damage control beaver permit valid as designated on the permit. River otter may only be taken by properly licensed trappers in possession of a special river otter trapping permit valid for an entire management zone. Beaver and otter trapping are allowed by special permit only. Application can be made at license agents or via Fish and Wildlife’s Internet license sales site www.NJ.WildlifeLicense.com. Applicants must have a current and valid trapping license to apply. 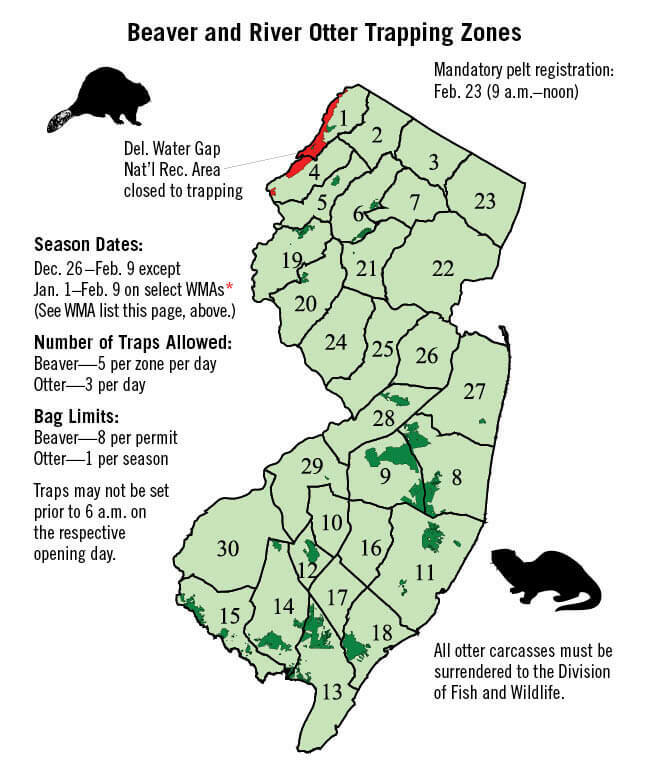 Additional information—including zone maps, boundary and permit quotas descriptions—becomes available Sept. 16 on Fish and Wildlife’s website, NJFishandWildlife.com or call (609) 292-1473. For the permit application process, changes, status check and directions on how to claim your permits, see details on License, Permits & Stamps. Lottery application period: Oct. 1–31. Applicants may apply only for one beaver trapping permit and/or one otter trapping permit. Successful beaver permit applicants are given first opportunity for otter permits in their respective zone. Award Notification and Permit Pickup begins Nov 5. Permits must be claimed by 11:59 p.m. on Monday, Dec 3. All Permits awarded in the lottery will be available to claim until 11:59 p.m. on Dec 3. Unclaimed, awarded permits will be redistributed in the over-the-counter sale. Application fee(s) for unclaimed permits will not be refunded. Over-the-counter sale of leftover and unclaimed permits: 10 a.m. Monday, Dec 10. Leftover permits will be sold at all license agents and at Fish and Wildlife’s Internet license sales at https://www.NJFishandWildlife.com. For leftover and unclaimed permit availability, see our website the afternoon of Thursday, Dec. 6. Fish and Wildlife’s Director may issue Beaver Damage Control Permits to owners or lessees of any land to control beaver damage. Damage Control Permits issued during the open beaver trapping season may be awarded to applicants that did not received a zone wide permit during the open lottery and who reside near the damage site. All beaver harvested on Damage Control Permits issued during the open season must be registered at an official beaver/otter check station. Beaver taken on Damage Control Permits issued outside of the open beaver trapping season may not be possessed or sold by the damage permit holder. Bag Limits: 8 beaver per permit; 1 otter per season. Recreational permit holders may use up to five traps daily per zone for beaver and up to three traps daily for otter. Damage control beaver permit holders may use up to 10 traps daily per site. Holders of both recreational and damage control beaver permits in the same zone may use a maximum of 10 traps daily. All traps must be checked and tended at least once per every 24 hours unless in tidal waters. Trappers may only possess one Special River Otter Trapping Permit per season. All beaver and otter trap tags must be clearly visible above the water or ice. A Fish and Wildlife-issued Beaver Transportation Tag or Otter Transportation Tag must be affixed to the beaver or otter carcass immediately upon taking possession of the animal. All otters harvested incidentally by beaver trappers (i.e., trappers possessing a beaver permit but not an otter permit) must be fully surrendered to the Division of Fish and Wildlife. The entire carcass, including the pelt, must be surrendered. All successful trappers (or their agents) must present their beaver and/or otter pelts at a designated check station for examination where pelt tags will be affixed. All otter carcasses must be surrendered when pelts are registered, as required by the Game Code. Failure to submit your carcass will result in the issuance of a citation by the Bureau of Law Enforcement. Trappers are requested to properly flesh and stretch all pelts for examination. Additional information on check stations will be provided to all permit holders. Fish and Wildlife will staff check-in stations at the Assunpink, Clinton, Flatbrook, Tuckahoe and Winslow WMAs and the Newfoundland Fire Company (tentative) on Saturday, Feb. 23, 2019 (9 a.m.–noon). Successful trappers who cannot attend the scheduled dates should contact either Joseph Garris at (908) 735-7040 or Andrew Burnett at (609) 748-2047 prior to Feb. 15 to make alternate arrangements. Permit holders will be notified via email, telephone or U.S. mail in the event the beaver and otter trapping season is extended for any reason, and notified of any change in the pelt registration date. Bobcats are classified as Endangered in New Jersey and are widely distributed across the state’s northern counties. Fishers have returned naturally—thanks to reintroduction efforts in NY and PA—to their historic range and have been documented in several northern and southern counties. There is no open season for either bobcat or fisher. Possession is restricted to those animals legally harvested in other U.S. states or Canadian provinces with proper documentation. Trappers finding a bobcat on their trapline are required to report the occurrence within 24 hours by calling 1-877-WARN-DEP (1-877-927-6337), but are strongly encouraged to call IMMEDIATELY upon discovery of a bobcat (or fisher) in any trap. If the bobcat is alive, call 1-877-WARN-DEP. A Fish and Wildlife Trapper Response Team technician will go to the site to safely release the bobcat. Data will be collected from the animal and ear tags will be inserted for future identification. Bag Limits: No daily or seasonal bag limit for any of these species. No trap may set prior to 6 a.m. Nov. 15. All traps must be tended once every 24 hours, preferably in the morning. 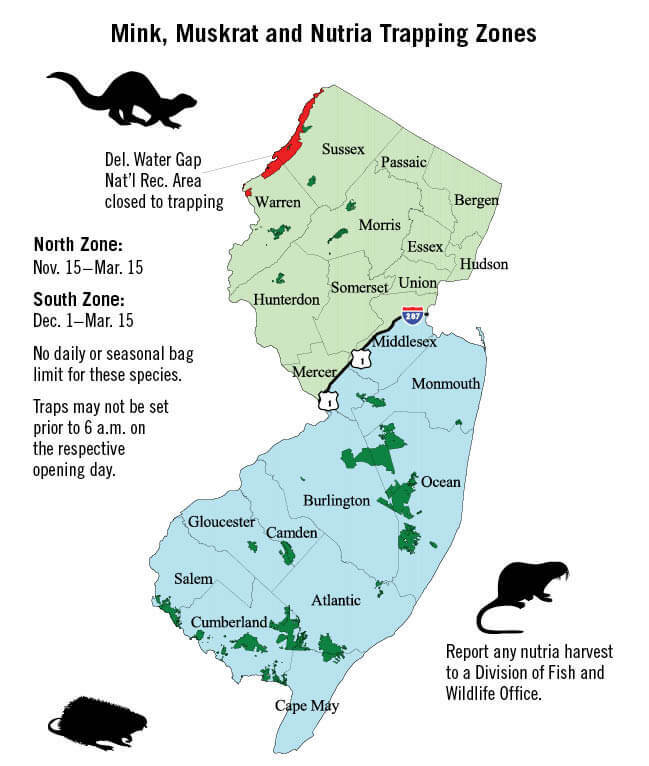 *The following state wildlife management areas are closed to trapping with cable restraints until 6 a.m. Jan. 1: Assunpink, Berkshire Valley, Bevans (Millville), Black River, Clinton, Colliers Mills, Flatbrook-Roy, Glassboro, Greenwood Forest (incl. Howardsville tract), Heislerville, MacNamara (Tuckahoe), Mad Horse, Manahawkin, Manasquan River, Medford, Nantuxent, Peaslee, Pequest, Port Republic, Stafford Forge, Walpack, Winslow and Whittingham. Cage and foot-encapsulating traps may be set on these WMAs beginning 6 a.m. Nov. 15. Trapping is prohibited at all times on the Delaware Water Gap National Recreation Area. Season Dates: (North Zone) Nov. 15–Mar. 15 in those portions of Bergen, Essex, Hudson, Hunterdon, Mercer, Middlesex, Morris, Passaic, Somerset, Sussex, Union and Warren counties lying north and west beginning at the intersection of U.S. Rt. 1 and the Delaware River at Trenton; then north along Rt. 1 to its intersection with I-287; then south along I-287 to its intersection with Rt. 440; then east along Rt. 440 to the NJ-NY state line. Season Dates: (South Zone) Dec. 1–Mar. 15 in those portions of Atlantic, Burlington, Camden, Cape May, Cumberland, Gloucester, Mercer, Middlesex, Monmouth, Ocean and Salem counties lying south and east of the aforementioned line above. Bag Limits: No daily or seasonal bag limits for any of these species. Traps may not be set prior to 6 a.m. on the respective opening day. All traps set for these semi-aquatic species in tidal waters only must be checked once per calendar day. Non-tidal water sets must be checked once every 24 hours, preferably in the morning. Trapping is prohibited at all times on the Delaware Water Gap National Recreation Area. No body-gripping or killer-type trap shall be used in non-tidal waters unless completely submerged underwater when the water is at the normal level. In tidal water, such traps must be completely covered at normal high tide. It is illegal to use, set or maintain a body-gripping or killer-type trap having a jaw spread greater than 6 inches without a permit for beaver or river otter. A body-gripping or killer-type trap with a jaw spread of no more than 10 inches may be used for beaver or river otter. Jaw spread shall be measured between the inner edges of the jaws across the trigger of a set trap. Beaver and otter trap tags must be placed above the water line and exposed to view. It is illegal to possess or use any steel-jawed leg-hold type trap (i.e., any coil-spring or longspring trap) anywhere in New Jersey. Foot-encapsulating traps which do not fall under this trap category may be possessed and used. No person shall set, use or maintain any type of snare unless they have first passed a Fish and Wildlife-approved trapper education course and carry on their person appropriate certification thereof. All live capture cable restraints must include a relaxing-type lock, except when submerged underwater or when set for mink, muskrat, nutria or weasel. A relaxing lock is defined as one that stops tightening when the animal stops pulling against the cable restraint. Cam-locks and spring-assisted locking systems are prohibited. All natural baits consisting of fish, bird or mammal carcasses or flesh used in trapping with live-capture cable restraints must be covered or concealed from view except when placed at least 30 feet from any trap set. Mink, muskrat and nutria cable restraints must be set within 50 feet of the mean high water line. All such traps must be set so that the distance between the ground/walking surface to the top of the loop does not exceed 7 inches. All such traps must be set so that the distance between the ground / walking surface to the top of the loop does not exceed 24 inches. The above requirements for cable diameters, loop stops and loop sizes do not apply to body gripping restraining snares that are completely submerged underwater at all times (e.g., when set for beaver or river otter). Enclosed or foot encapsulating (also known as enclosed foothold or dog-proof traps) traps are now legal for trapping. These traps have been specifically designed to capture species such as raccoon and opossum (which possess a degree of manual dexterity) while minimizing the capture of non-target animals especially domestic dogs and cats. Enclosed foothold traps are a live-restraint trap which do not result in the death of the captured animal or in the potential for significant injury. All triggering and restraining mechanisms shall be enclosed by a housing. The triggering and restraining mechanism is accessible only by a single opening when the trap is set. The access opening does not exceed 2 inches in diameter or when measured diagonally. The triggering mechanism can be activated only by a pulling force. The trap has a swivel-mounted anchoring system. If an accidental bobcat trapping occurs, it is mandatory that you immediately call NJ Division of Fish and Wildlife’s Trapper Response Team at (877) WARN-DEP (877-927-6337) while the bobcat is held in the trap so that we may obtain genetic samples. For tips to avoid the accidental capture of bobcat or to prevent injury if one is trapped, scan the QR code, to the right. New Jersey Division of Fish and Wildlife needs your help by reporting bobcat sightings so we can better understand the size, distribution and genetic structure of our bobcat population. www.nj.gov/dep/fgw/ensp/rprtform.htm. Data from south Jersey is of particular interest. Dead on the road—call 1-877-WARN-DEP (877-927-6337) to report the carcass location.